Ina Garten, aka The Barefoot Contessa, and her cookbooks are already my go-to for basic cooking guidance, but her show serves as my inspiration for more adventurous culinary efforts. I’ll follow along with an episode of the Barefoot Contessa, and then choose a recipe to try in my tiny New York kitchen. We’ll see if I can keep up with the Contessa! The Set-up: Ina is cooking recipes inspired by Italian restaurants at home. 0:54 – The sauce is roasted in the oven and has all the usual suspects – garlic, oregano, onions, olive oil and “a lot of vodka.” Joe’s influence seems to be upping the alcohol factor in our cooking game. 0:59 – Joe’s Pro Tip #1: when using dry herbs (in this case oregano, red pepper flakes, and black pepper) put them into the oil before you add the tomatoes and ‘sweat’ them out to get the best flavor. 1:06 – While the onions, garlic, and herbs sauté we head off to Nick & Toni’s via hand-held camera with commentary from budding film auteur, Joe R.
2:03 – Ina teases him a little about “quitting his day job.” They have an easy rapport, so I don’t think he’ll be storming out and telling her to finish the sauce herself, although that would be super dramatic and hilarious. 3:17 – Apparently this recipe has been on Nick & Toni’s menu for 22+ years ever since the owners discovered the dish on a trip to Italy and convinced the chef to share it with them. I feel like not many restaurants have a ‘signature’ dish any more – all seasonal, farm to table, etc. 5:29 – The process for Penne Alla Vecchia Bettola is pretty intense – canned, whole, peeled San Marzano tomatoes are squished by hand into the softened vegetables, then the sauce roasts for 1 ½ hours. After it cools for a few minutes the entire batch is pureed in a blender, then reheated with a little heavy cream, fresh oregano and parmesan cheese. Nothing hard here, but a lot of different stages. 5:55 – PS: I have no idea how Joe has managed to keep his pristine white chef’s coat tomato-free. He must have some sort of chef force field in effect. 6:43 – The penne is cooked al dente in hot, salted water; then drained and added to the sauce to cook just a little longer. A final sprinkling of Parmesan cheese and fresh oregano and we’re done! 6:49 – Ina mentions that the vodka is doing “it’s thing.” I have no idea what she means, so pause for a quick Google. FYI, chowhound says (food + alcohol = flavor extraction) and because vodka is flavorless (unlike wine) the effect is heightened impact of the tomatoes, without the introduction of a new flavor. 10:16 – Ina is flying solo for the next recipe: Rum Raisin Tiramisu. She claims that all Italian restaurants have tiramisu on their menus, but that it’s very easy to make at home. It is also the dessert that launched 1,000 Sleepless in Seattle jokes. So there’s that. 11:42 – Pro Tip #2: when making an egg-based custard, beat room temperature egg yolks until they are pale yellow and drizzle off the beater in a ribbon. 12:39 – I see Joe’s boozy influence in this recipe… Ina’s making a twist on the classic by adding rum to the custard, dipping the ladyfinger cookies in rum, and soaking the raisins in rum. So what I’m saying is: RUM is the name of the game. 13:14 – Pro Tip #3: Adding a little orange juice, vanilla extract, and vanilla bean seeds will help balance out the ‘edge’ in the rum. 15:27 – I’m fascinated by the logistics of finding the right size dish to fit exactly twelve ladyfingers. I always end up with too few of something or too many – TV magic, I suppose. 15:43 – Ina advises us to let the assembled tiramisu chill overnight to let the custard set. Now I know that TV magic is at work here, because she doesn’t have to re-arrange 1,500 things in her refrigerator to make space for a 9x13 pan. 20:11 – We’re back with Ina to make restaurant-style antipasto. First – Prosciutto Wrapped Melon wedges. I love when the name of the dish and the recipe are the literally the same thing. She’s using cantaloupe, but says we can use any type of ripe melon. 21:45 – Ina references our patron saint, Julia Child, who apparently didn’t consider Italian food “cooking.” Love you Julia, but I’m glad Ina’s on our side – she says that this is “good news” because it’s so easy. 22:09 – Next up, Tomato, Fresh Mozzarella and Pesto. Ina claims that she made her own pesto (recipe here), but says we can use store bought “as long as it has great flavor.” She really is taking it easy on us today. 22:34 – Last item, Breadsticks Wrapped in Salami. I think she may be teasing us, but I’m going to take these at face value. She did say that these were easy and I’m fairly sure that small children could do this. 26:12 – Ask Ina time! First question: should cooked pasta be rinsed under cold water? Ina manages not to look horrified and says no, that this cools the pasta too much. Pro Tip #4: the small amount of starch coating the pasta helps thicken the sauce and you may actually want to reserve a little pasta water before draining for this purpose. 27:23 – Second question: why do chefs put salt in the pasta water, and is this necessary? Ina again refrains from throwing up her hands in dismay and says yes, this is a necessary step. Pro Tip #5: Salting the water helps flavor the pasta from the inside. Salting it later just leaves the salt on top. 28:34 –Third question: does Ina have a great recipe for garlic bread? Oh, boy does she! We get a quick demo of Garlic Herb Ciabatta, which involves sautéing a spread of garlic, parsley and oregano. Yum. Carbs. 29:22 – Last question: Help, it’s pasta night and I don’t have any marinara! Ina offers up a quick “cheat.” She suggests adding some sautéed onion and garlic to a store bought sauce and promises not to tell anyone. Our secret! Ina + professionally trained chef is always interesting to see. I wonder if this is like sports where playing with someone better helps improve your game? Ina was really focused on making easy, minimal ingredient recipes in this episode – definitely more preparation and assembly than cooking. Lessons Learned: I was a little intimidated by the knowledge that Penne Alla Vecchia Bettola was a recipe served in an actual restaurant, but the ingredients are really approachable (99% I already had in the fridge or pantry, I bet you do too) with one exception - the fresh oregano. I hit some minor snags, but nothing a little practice and some thinking on the fly couldn’t solve. Number one – normally recipes direct you to sauté the onion first and then add the more delicate garlic, but this recipe calls for the onion and garlic to sauté at the same time. That’s all well and good if you keep the heat quite low – I came thisclose to burning the garlic, so watch carefully. Number two – the whole San Marzano tomatoes I had (Cento brand) were packed in a lot of pureed tomato. I strained the two cans which did yield some watery liquid and added both the squished whole tomatoes and the puree. I ended up with slightly more sauce, but the seasoning still tasted right to me. Just something to keep in mind. I can’t honestly say that this is small kitchen friendly, but it is do-able. I used one large, covered oven-safe sauté pan, a large sauce pan for the pasta, one medium bowl, a blender, a sieve/strainer, a colander, and a box grater in addition to the basic items like spatulas, cutting board, etc. A very large spoon or ladle will be particularly useful for the pot-to-blender step. 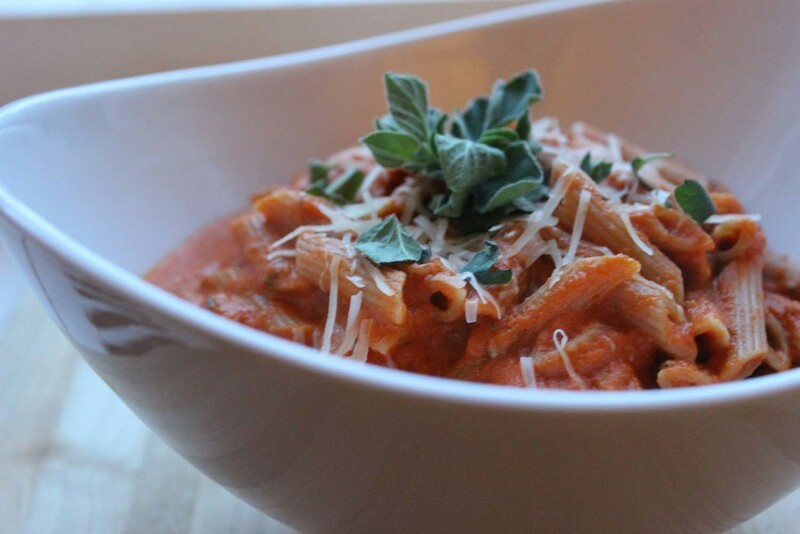 I had never eaten a vodka sauce before or cooked one for that matter, but Mike and I both really liked the way the Penne Alla Vecchia Bettola turned out. Very creamy, but not too heavy and with a nice subtle heat from the red pepper flakes. It’s a little more work to make than my standard tomato sauce (which is essentially the ‘cheat’ Ina suggested), but I think the effort is worth it. A nice Sunday afternoon, no stress type of dish since there’s more than an hour of ‘down time’ while the sauce roasts in the oven. If you’ve got the equipment and the time, definitely give this one a shot!